The political consensus on privatisation is finally breaking, but how was that consensus maintained through a decade of crisis? Laura Basu describes how the media’s fugue state is fuelling ‘free market’ capitalism. Laura Basu is the author of Media Amnesia: Rewriting the Economic Crisis, a look behind the media’s coverage of the 2008 financial crash, the eurozone crisis, austerity and rising inequality, to decode the workings of media power and its instituting of an infinite cycle of crisis. After the Carillion scandal broke in January and now with outsourcing giant Capital requesting a £700 million bailout, assumptions about the efficiency of the private sector vs the public sector finally seem to be coming under scrutiny. The BBC’s John Pienaar described the Carillion scandal as a ‘watershed moment for the privatisation debate’. The construction giant held hundreds of governmental contracts in the UK. It had protected bonuses and shareholders while blacklisting union activists. It collapsed under a £1.6bn debt pile, putting thousands of jobs at risk. Pienaar claimed the company’s downfall could spur ‘an ideological debate as fundamental as any seen since Margaret Thatcher began to roll back the frontiers of the state in the 1980s’. Soon after, Jeremy Corbyn took the plunge and announced that Labour would stop the ‘outsourcing racket’ and make the public sector the default choice for providing government services. His position is strengthened by an official report that public-private partnerships will cost the British taxpayer $275 billion by the 2040s. The Guardian described his proposals as ‘a radical departure from the cross-party consensus of the past 25 years’. 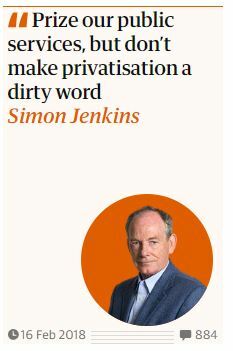 Privatisation has been one tenet of a far-reaching trickle-down ideology that sees the private sector as more efficient than the public sector and advocates privatisation, deregulation and tax cuts for businesses and high earners. It began with Thatcher and Reagan in the 1980s and spread around the world. After the 2008 banking crisis, these kinds of reforms were ramped up, despite the fact that the economic model spawning, them – one based around the needs of large corporations – was what had caused the crisis in the first place. Former Greek finance minister Yiannis Varoufakis has claimed that austerity on the one hand and these kinds of ‘pro-business’ measures on the other are two prongs of a ‘class war’ waged by governments since the Crash. They have been buttressed by the media’s amnesia towards the crisis, which has shifted blame from bankers and ‘casino capitalism’ onto public sectors and ordinary people. In Greece, in addition to drastic public spending cuts and tax increases, bailout conditions included the privatisation of ports, airports, roads, water and electricity, public buildings and real estate, mining rights, the lottery and railways. In the UK, privatisation and deregulation have increased while corporation tax was cut in 2011, 2012, 2013, 2015, 2016. Trump’s tax reforms will slash US corporation tax from 35% to 21%. However, research carried out by myself at Cardiff University has shown that while austerity has been controversial, trickle-down reforms like privatisation, deregulation and corporation tax cuts have been embraced by the media. In the sample of five UK mainstream media outlets, only one – the Guardian – took a more critical stance towards these reforms than a supportive one. Even that outlet contained almost as much favourable coverage as critical coverage. The right-wing sections of the press, which dominate the British media landscape, were unflinchingly supportive of these measures and urged the government to go even further. The idea behind these policies is that what’s good for business is good for everyone. If businesses are handed more resources, freed from regulation and handed tax breaks, they will be encouraged to invest in the economy, creating jobs and growth. The rich are therefore ‘job creators’ and ‘wealth creators’. One exposé revealed that in the UK, business is handed £93 billion a year in this kind of corporate welfare. With a few notable exceptions, there has been a black hole around corporate welfare in public discourse. This is despite the fact that these policies have an impressive fail rate. Business investment and productivity growth remain low, as corporations spend the savings not on training and innovation but on share buy-backs and shareholder dividends. Share buy-backs are when a company purchases its own shares, decreasing the number of its shares on the open market and thereby increasing their value. According to the Financial Times, in 2014, the top 500 US companies returned 95 per cent of their profits to shareholders in dividends and buybacks. Meanwhile, inequality is spiralling. How has the trickle-down consensus been maintained despite the biggest economic crash of a lifetime and a decade of political and economic turmoil? Since the 1970s, when the previous form of capitalism was in crisis, ‘neoliberal newspeak’ began to infiltrate an array of institutions – universities, central banks, Treasury departments, international bodies and think tanks. At that time neoliberal ideas were marginal, but they gradually started to take over. This didn’t happen by chance, but was the result of a co-ordinated effort by neoliberals, centered around the Mont Pelerin Society. The same was true for media institutions. Media systems around the world were privatised and deregulated. Public service broadcasters like the BBC were restructured around internal markets. Business and financial news began to take over from labour and society newsbeats. Wealthy business people began to be called upon as experts not only on business affairs but on a whole range of social issues. By the time of the 2008 crash, neoliberal ideology had become so dominant that other positions were virtually invisible. And so, the same people responsible for financial collapse were called upon to offer solutions. In my study, business and finance representatives were the second biggest category of sources featured in the media coverage. The biggest category was politicians, who until the Corbyn shake-up have been pursuing a blindly pro-business agenda. These two groups got to set the news agenda and the terms of debate. Other voices – trade unions, campaign groups, activists and academics – were sidelined. These groups helped manufacture an amnesia that was taken up zealously by some sections of the media and passively reproduced by others. It has taken the Grenfell fire tragedy costing the lives of at least 70 people and the collapse of Carillion for the political consensus to even begin to be questioned. If we are to build on this progress we will need to start having grown-up conversations about corporate welfare and the strengths and weaknesses of market capitalism. Laura Basu is a fellow in the Media and Communications Department at Goldsmiths, University of London, and at the Institute for Cultural Inquiry, Utrecht University. She is the author of Media Amnesia (Pluto, 2018), and editor of The Media and Austerity (Routledge, 2018). Visit her website here. Media Amnesia: Rewriting the Economic Crisis is available to buy from Pluto Press.